I baked up the banana cake from my last post (since, again, there were leftover bananas) for these. Crumble cake (cut off the dark edges if there are any) into a large bowl. Cream cream cheese and butter. Mix in powdered sugar (more or less, depending on your taste), vanilla, and coconut. Pour the mixture into the bowl with the crumbled cake and mix well. Using a mini ice cream scoop, scoop out cake balls and roll it with hands until round. Place balls onto a cookie sheet lined with parchment paper. Place cookie sheet with balls into the fridge for about 30 mins. Place chocolate chips in a heat proof bowl. In a saucepan, heat the cream until just starting to bubble (do not leave unattended). Pour cream into the bowl of chocolate chips. Stir until chocolate is completely melted and shiny. 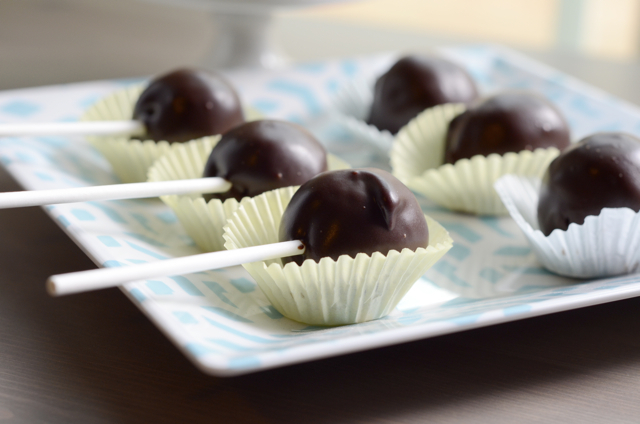 Dip cake balls into the chocolate and scoop out with two forks. Place them on cookie sheet lined with parchment paper. Dip the tip of a lollipop stick in the chocolate, stick it halfway through the cake balls, and dip the cake ball in the chocolate to coat. Stick the pops in styrofoam blocks. Thanks kat! Sure I’ll visit your blog. They look great! Does the chocolate coating melt or get soft at room temperature? The coating is always the most difficult part for me. Hey thanks, I’ll let you know if I figure anything else out! Aren’t cake balls the best thing to do with leftover cake! Yours look great! You are currently reading Banana Coconut Cake Balls with Chocolate at foodie julie.